Løberen (The Runner) is a one-stop-shop for all those who enjoy running. It sells shoes, clothing and accessories, as well as offering expert advice and guidance. And, whilst the customers aim at the highest energy levels possible their favourite retail outlet has decreased energy consumption and running costs for lighting. 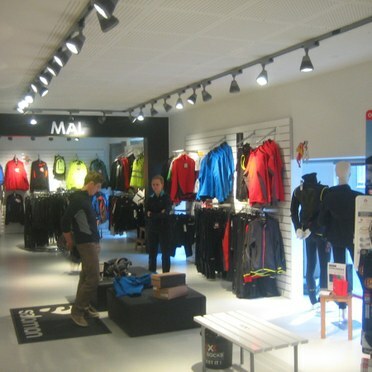 Prospector 12W LED spotlights were selected by the company when it recently relocated to newer premises within Aarhus. Despite a substantial increase in sales floor area - it is now Denmark's largest running store - Løberen Aarhus has cut its energy usage by about two-thirds over the old scheme. Mounted on Thorn Supertrack, the 145 display fittings give dramatic emphasis to the merchandise while providing attractive overall lighting for the 'eco' store. LED spotlights were chosen because they are economical to run and easy to maintain. The alternative to LED was 35W halogen, and had halogen been chosen maintenance and lamp replacement would have been time-consuming, costly and inconvenient. Besides giving a warm-white light (2700K) with superior colour rendering (CRI > 90), the LED is mounted at the focus of the reflector; thus its light is concentrated in a well-controlled, near-parallel beam - like a shaft of sunlight.